Warrington's Blake Austin was sent to the sin-bin for a challenge which left Hull KR's Joel Tomkins in hospital with a severe concussion. Warrington’s Blake Austin was sent to the sin-bin for a challenge which left Hull KR’s Joel Tomkins in hospital with a severe concussion. 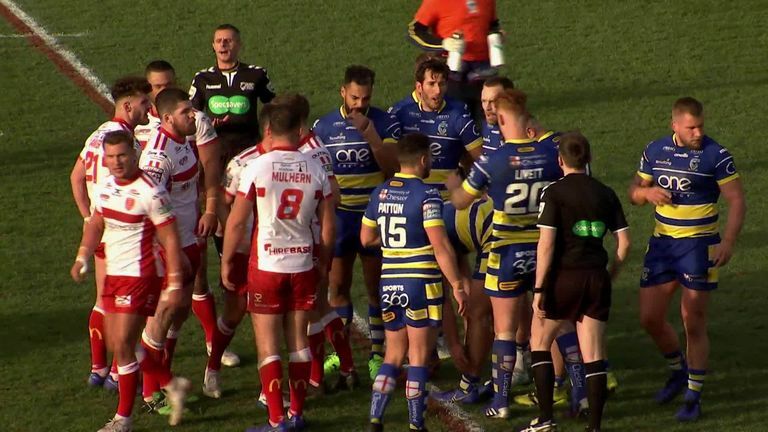 Hull KR captain Joel Tomkins was taken to hospital with severe concussion after his side’s 28-14 Betfred Super League defeat at Warrington Wolves. Tomkins was on the receiving end of a hefty challenge from Warrington’s Blake Austin while lying on the floor during the first half at the Halliwell Jones Stadium, with Rovers coach Tim Sheens describing his captain as being “in a bad way”. Austin was sent to the sin-bin for the challenge by referee Liam Moore and the incident will no doubt be looked at by the RFL match review panel on Monday.